A sime and extremely effective plier. You can wrap ring stock around the barrel shaped jaw, then tap it slightly on a mandrel and instantly make a complete ring, half or quarter shank for repair. Head size is 14mm. You can get a perfect circle every time with wire up to 2mm thick. Made of Stainless steel with PVC coated handles. Overall length is 6”. A sime and extremely effective plier. You can wrap ring stock around the barrel shaped jaw, then tap it slightly on a mandrel and instantly make a complete ring, half or quarter shank for repair. Head size is 19mm. These "Wrap n Tap" pliers offer the user greater versatility. This features diameters of 5mm (3/16"), 7mm (9/32") and 10mm (3/8"). You can shape rings for children, ladies or gents. Very little tapping is necessary and half-round will not twist, scratch or deform. 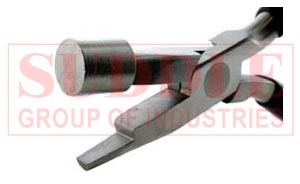 These pliers are especially good for looping stock that has a pattern or hollow stock. 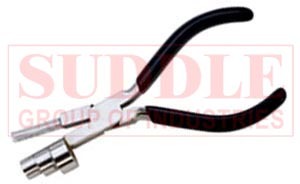 Pliers are 6-1/2" in length, have cushioned grips and are made of stainless steel. These "Wrap n Tap" pliers offer the user greater versatility. This features diameters of 13mm (1/2"), 16mm (5/8") and 20mm (7/8"). You can shape rings for children, ladies or gents. 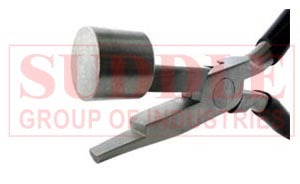 Very little tapping is necessary and half-round will not twist, scratch or deform. These pliers are especially good for looping stock that has a pattern or hollow stock. 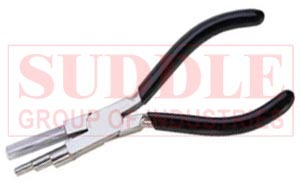 Pliers are 6-1/2" in length, have cushioned grips and are made of stainless steel.